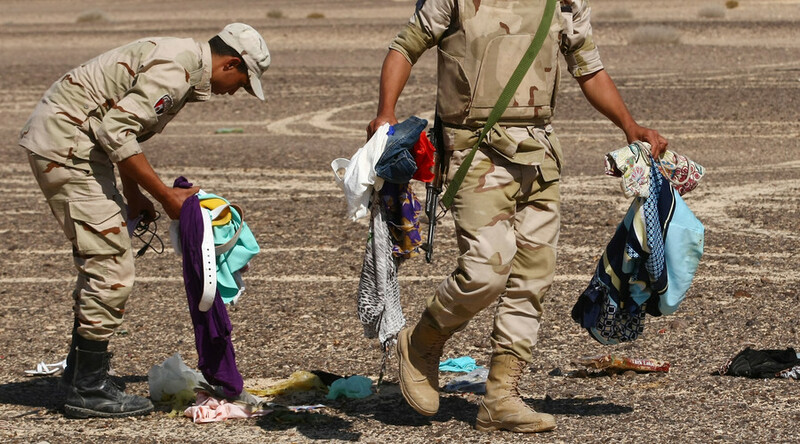 The search and recovery operation continues in Egypt’s Sinai after a Russian passenger plane crashed there, killing all 224 people on board Saturday. Russian and Egyptian investigators are looking into the causes of the tragedy. At least 100 bodies from the crashed plane have been identified, Deputy Prime Minister Olga Golodyets said. The Sunday Times paper reports that the UK’s intelligence leadership believes that the Russian jet which crashed in Egypt last week was brought down by a bomb planted by an Islamic State offshoot in the Sinai Peninsula. The so-called Sinai Province group is headed by Abu Osama al-Masri, an Egyptian cleric, who agreed on a deal with IS last year in Syria. According to the paper, UK officials have confirmed that Masri is a “person of interest” and that Britain is ready to help Egypt or Russia in a “kill or capture” mission against him. Masri and his group claimed responsibility for Russian plane’s crash in Sinai shortly after it occurred. President Vladimir Putin has signed an order officially suspending all passenger flights to Egypt. The order also recommends that companies halt sales of tours to Egypt, especially those involving air travel. The government has been instructed to facilitate the return of Russians who are still in the country, as well as their baggage. Investigators of the jet crash are "90 percent sure" that the noise heard in the final moments of the cockpit recording was a bomb exploding, a member of the investigation team told Reuters. Emirates Airlines expects the plane tragedy will result in demands for stringent aviation security across the globe, the airline’s president, Tim Clark said, as cited by Reuters. The luggage of Russian tourists who arrive from Egypt is undergoing stricter than usual checks, said Igor Pedan, an official from UTG aviation services, which maintains Moscow’s Vnukovo Airport. “The procedure was non-standard, I can say,” he said. “All luggage was sent to a special zone, [it] was checked by cynologists [dog-handlers] with [sniffer] dogs, the luggage was checked by special equipment and only then was transferred to a clear zone, for passengers to pick it up, ” he added. At least 11,000 Russians have returned from Egypt to Russia in the latest 24 hours, Russian deputy PM Arkady Dvorkovich said. "Today [on Sunday], the number will be even higher," he said. "Today will be the hottest day in this sense." Earlier, the authorities said that there are an estimated 80,000 Russians staying in Hurgada and Sharm el-Sheikh.